This volume, the first to be published (the second and third volumes will appear in spring 2008 and spring 2009), opens with a User’s Guide that explains the development, purpose, and content of the book, and then lays out a comprehensive Model Criminal Code. The code is divided into two parts: a “General Part” that contains general principles of criminal law and penalties, and a “Special Part” that presents a catalog of criminal offenses, including those such as sexual offenses, organized crime, and corruption that are particularly common or destabilizing in post-conflict environments. 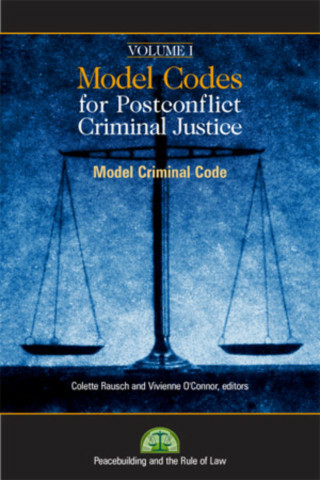 The Model Codes for Post-Conflict Criminal Justice is the culmination of a six-year project spearheaded by the United States Institute of Peace and the Irish Centre for Human Rights, in collaboration with the UN Office of the High Commissioner for Human Rights and the UN Office on Drugs and Crime. More than two hundred experts and practitioners from across the world were involved in the drafting, vetting, and revision of the provisions and their commentaries. This enormous breadth of expertise has allowed the Model Codes to draw on lessons learned in a variety of post-conflict states and from the laws of a remarkable variety of the world’s legal systems and traditions. The result is an indispensable resource for those striving to reestablish the rule of law in societies recently wracked by violent conflict. —Each copy of this volume contains a CD of the complete text.